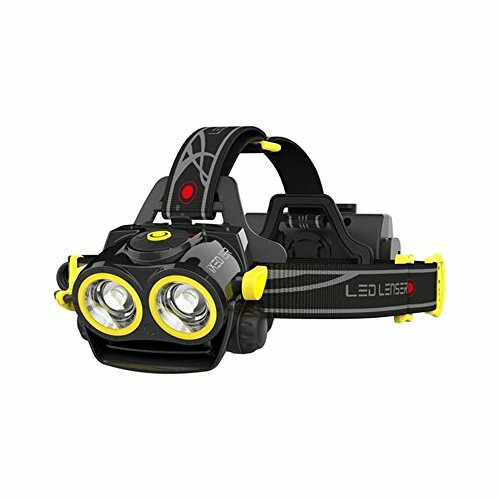 The phenomenal iXEO19R from Ledlenser is an industrial-strength rechargeable multi-use headlamp that will effortlessly light up a railway tunnel, pylon, or even an entire work site area. With its sensational 2000 lumen white light that can easily beam out to 300 meters, the XEO19R is a truly stunning piece that will chase the darkness away and make life easier for professionals where a reliably powerful work light is essential. Its incredible performance comes from two frontal premium LEDs, each of which can be operated independently or together, via X-Lens Technology, to form a single shatteringly-strong beam of even bright white light. The light is so strong that the iXEO19R even features its own thermal Speed Cooling System which results in the LEDs being cooled by an inflow of air resulting in a brighter light the faster the user travels - especially useful when on bicycles or motorized vehicles out in open environments. Light quality is astounding because the iXEO19R incorporates the patented Advanced Focus System, which combines lens and reflector system to ensure powerful unbroken light from long-distance flood to near-view spot beam. The impressive Smart Light Technology feature offers 6 different light functions for any situation: Boost, Low Power, Power, Opti-Sense (Auto-dim), Strobe and an Emergency (10 lumens) light. There is a choice of Energy Saving or Constant Current light management programs to help conserve power (and thus optimize light duration) or boost light intensity as and when required. Surprisingly easy to master, the iXEO19R has a front switch to control the light functions, Speed-Focus to operate the two lenses and a power box with integrated charging status display. If you have any questions about this product by Ledlenser, contact us by completing and submitting the form below. If you are looking for a specif part number, please include it with your message.